Micro Plastics Custom Injection Moulders established in 1977 and is an Australian family owned business as a custom injection moulders to the plastics industry. Micro Plastics was originally located in Braeside, Melbourne Victoria, however as demand grew due to our reputation for quality, reliability and expertise, so did our number of moulding machines. 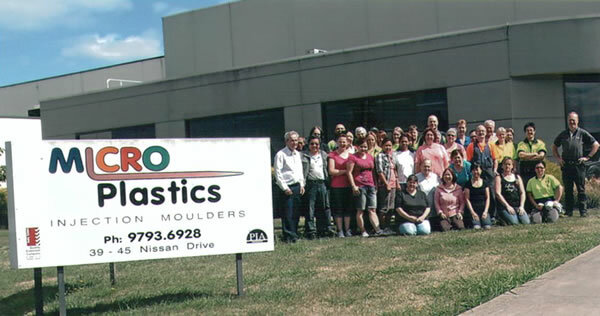 To accommodate this, in 1999 we relocated to purpose built premises in Dandenong South, Melbourne, Victoria. We are now located in a 4000 square metre modern building which houses 23 modern injection moulding machines ranging in size from 60 ton to 800 ton. Micro Plastics provides for a range of customers including, but not limited to, Pool & Spa, Lighting, Natural Gas Fittings, Safety Fencing and Housewares. Please take a look around our website and view what services we have to offer or contact us direct. Micro Plastics was established by Tool Maker & Designer Robert Wilson. The Managing Director, Russell Lacy has been with Micro Plastics for 36 years and has extensive experience in all areas of plastics as well as a reputable relationship with all of our customers and an extensive knowledge of the company and its ability to provide to the requirements of those customers. Micro Plastics fully trained staff are committed to customer satisfaction. The majority of staff have been employed with the company for 10 years plus, giving them an extensive knowledge of the importance we place in giving quality, reliable service at all times.